Description : Here we have a fabulous dual signed 12oz everlast glove that has been signed by 2 of Mexico's modern day boxing legends in 3 weight division champion Marco Antonio Barrera & 3 weight division champion Eric "El Terrible" Morales. 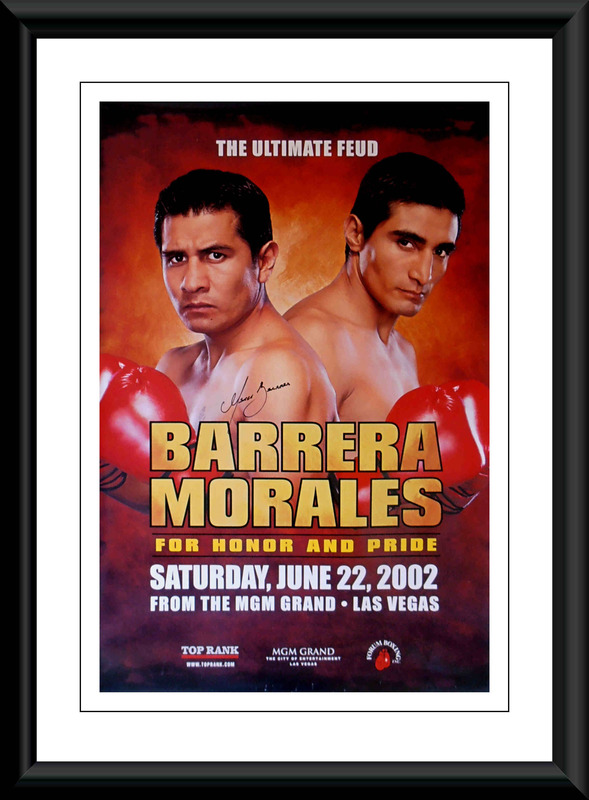 These 2 Mexican Immortals fought out one of the most savage trilogy's in modern day boxing.......The Barrera versus Morales battles are one of boxing's most famous fight trilogies, involving two of Mexico's most revered boxers, Marco Antonio Barrera (nicknamed "The Baby Faced Assassin") and Erik "El Terrible" Morales.......The first bout took place on February 19, 2000, at the Mandalay Bay Resort and Casino, in Las Vegas and was televised on HBO Boxing. Morales was declared winner by split decision, with scores of 115-112, 114-113 and 113-114 and captured the WBO Super Bantamweight title. This bout was named as Ring Magazine's Fight of the Year for 2000, before being named as the best Fight of all time in the same year........The second bout took place on June 22, 2002, in MGM Grand Las Vegas, This is often described as the most tactical fight of the trilogy. Nevertheless, there were plenty of punches, but with Barrera fighting a more technical approach, Morales opted to use heavier punches, dropping Barrera to the canvas in the 7th with a blow to the abdomen. Barrera was nonetheless declared the winner by unanimous decision, with scores of 116-112 and 115-113 and captured the WBC Featherweight title.......The third bout of the trilogy was fought at the Super Featherweight division. Morales had gone on to win the WBC title in that division after defeating Jesus Chavez and Barrera had lost recognition as world boxing champion after being defeated by Filipino boxer Manny Pacquiao, so he moved up to the Super Featherweight division. The fight took place on November 27, 2004 at the MGM Grand in Las Vegas. Barrera was declared the winner and new WBC Super Featherweight champion by majority decision, with scores of 115-113, 115-114, and 114-114. 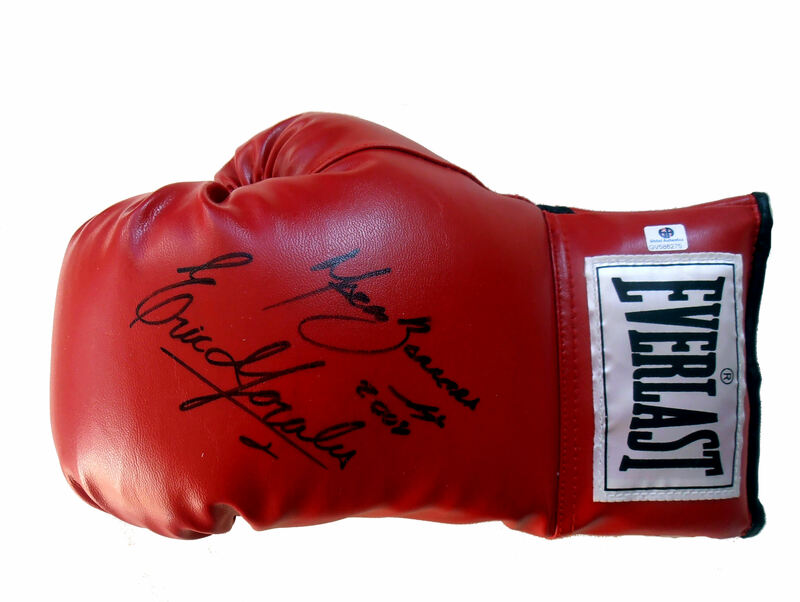 This bout was named Ring Magazine's Fight of the Year for 2004.......This glove comes with the COA from Global Authentics along with a lifetime and beyond guarantee of authenticity from KOfightposters.com.